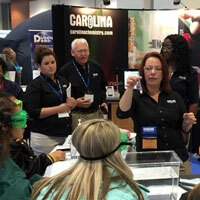 Carolina&apos;s team attends several domestic and international education conferences every year, including the national and regional National Science Teachers Association (NSTA) conferences (and many others). At each conference our exhibits provide you the opportunity to explore our products through interactive workshops. Our exhibits let our staff learn how we can better serve you—a crucial component of our world-class support. View our Conference and Workshop Schedule to find out where and when you can join Carolina in person. This schedule is updated throughout the year, so be sure to check back often so you don&apos;t miss us! 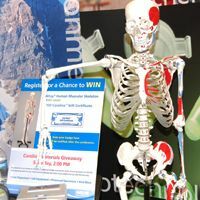 When you visit a conference where Carolina is exhibiting, step into our booth to enter a true science education "experience". We offer continuous engaging, hands-on demonstrations where you can get involved—and maybe even walk away with some goodies of your own. Plus, each in-booth demonstration visitor will receive a Carolina QuickTips™ sheet that features an overview of the demo, materials list, activity procedure, and additional information so you can re-create these useful activities in your own classroom. You can also speak with our expert staff members to learn about our latest products and services. Plus, we love to meet teachers! Carolina offers a wide range of workshop sessions at most of the conferences we attend. Workshops usually take a hands-on approach, where attendees get a chance to experience our products and solutions. Our broad topic coverage assures that there is something for everyone, including Life Science, Physical Science, Earth and Space Science, Curriculum Programs, eLearning Solutions, Inquiry-Based Education Topics, and much more. If you are attending a conference with Carolina workshops, be sure to sign up early, as most of our workshops fill up fast. If you’ve recently attended a conference and participated in one of our exciting workshops, please visit our Workshop Details and Resources page to download the presentations and information about the products featured in the sessions. If you attended a recent conference or want to have a look at our latest booth experience, check them out on our Facebook page. If you&apos;ve ever seen an enormous crowd gathered inside the Carolina booth, we were probably holding one of our famous giveaways. At many shows we attend, we will hold contests for Carolina Gift Certificates, Carolina products, and a number of other goodies. So be sure to check with our booth staff to learn about any giveaways or contests that might be going on at the show you&apos;re attending. If you had to leave a recent conference early, check back on our Facebook page to find out if you were a winner!